The 2018 festival will take place from Friday 7 to Sunday 9 September, as part of the national Heritage Open Days weekend. We’ll be repeating the most successful elements of our last two Festivals again this year. If you’ve been before you’ll know how much fun these are … and if not, save the dates now and join us this year! Back by popular demand: Silent Movies with live organ accompaniment - A series of comedy shorts starring Monty Banks, Charlie Chaplin and Laurel & Hardy. Watch hair-raising moving train stunts through your fingers with Monty Banks in Chasing Choos Choos, laugh out loud at roller skating waiter Charlie Chaplin in The Rink, and dodge as The Two Tars Laurel & Hardy get into a car chase in a traffic jam. Don't miss family fun at the Silent Movies. This year we are showing a series of Comedy short movies with Odeon Leicester Square Organist Donald MacKenzie providing a live soundtrack on the Willis organ. Popcorn and icecream will be on sale. Tickets £10, children under 18 free). A free non-musical social event with food for everyone to enjoy. This is a free social event in the Parish Hall for all the family. Join us for a friendly informal evening of chatting and a fun game with free tea and coffee available. Hot Jacket Potatoes and a variety of delicious fillings will be on sale, to help us with the catering please order your choice in advance via the online booking form on the Music for All @ SMSG website. You can also find out more about the Organ Festival events, tell us what music you would like to hear in our concerts and discover how to join our enthusiastic group of Music for All @ SMSG volunteers who keep our musical events running so successfully. To complement the Silent Movie with live organ accompaniment showing on Saturday evening (a ticketed event which can be booked online), the Projected Picture Trust presents an exhibition of photos, equipment and film-related memorabilia of the Silent Movie era. 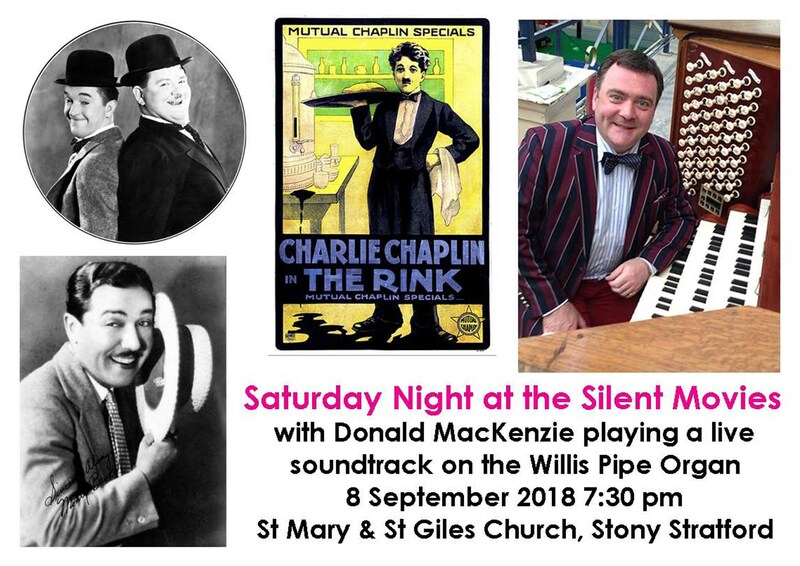 There will also be an exhibition about the Willis organ telling the story of pipe organ music at St Mary & St Giles, Stony Stratford, in the past, present and future. The church will not be available during the day on Saturday as there is a wedding, so please enter by the Parish Hall garden door only. The church will be open on Sunday for Organ Festival events. At 12 noon on Sunday there will be a screening of the Video of the Willis organ in the Parish Hall. Donations to the Organ Maintenance Fund welcomed. Your chance to try playing a wonderfully restored Victorian pipe organ. This is a golden opportunity for you to play, with help from our organ volunteer team, those wow chords on the pipe organ. Budding organists and pianists of all ages - please bring your favourite sheet music to try on the pipe organ. The organ console is in the gallery which is reached by stairs, so this event is unfortunately not accessible for wheelchair users, who can access the church via the Parish Hall to listen to the organ at other events and see the exhibition by the Projected Picture Trust. This is a free drop in event. Light lunch and other refreshments are on sale from 12 noon. Donations to the Organ Maintenance Fund welcomed. Get to know our Willis Pipe Organ! ‘Father Willis’ was a leading Victorian organ builder, making many innovations in organ technology and sound. 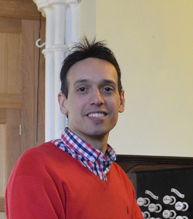 In this free one-hour talk, Jonathan Kingston explains how the Willis pipe organ works at St Mary and St Giles, Stony Stratford. Back by popular demand! 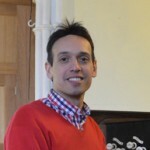 A talk at the organ console with excerpts on the organ by Jonathan Kingston, who will explain and demonstrate what the different controls on the console mean. The organ console is in the gallery which is reached by stairs, so this event is unfortunately not accessible for wheelchair users, who can access the church via the Parish Hall to listen to the organ at other events this weekend and see the exhibition in the Parish Hall. Refreshments will be available. Donations to the Organ Maintenance Fund welcomed. Please book ahead as numbers around the console are limited to 30 people. Our closing recital of the Organ Festival is the popular one-hour audience requests concert when Jonathan Kingston plays the music you have chosen - book your request in advance via the website booking form below or email details of your favourite piece to events@musicforallsmsg.org for Jonathan to play. Jonathan will compile the programme from the suggestions of music, which may include music by extraordinary female composers. Drop in event with Refreshments. Donations to the Organ Maintenance Fund welcomed. Request your favourite piece of music for the recital on 9 September at 16:30 pm. You can read about our previous pipe organ festivals (2017, 2016, 2015).